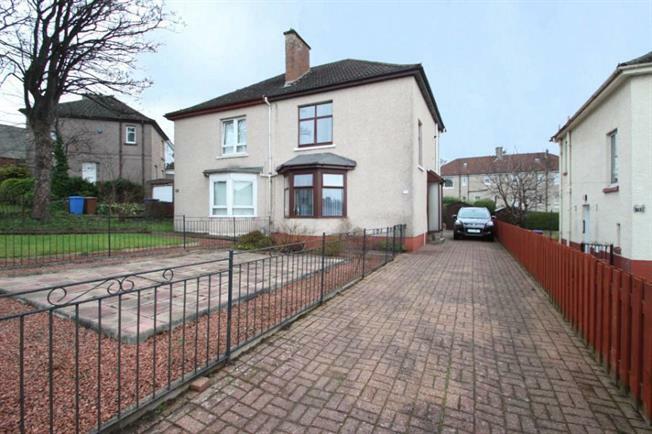 3 Bedroom Semi Detached House For Sale in Glasgow for Offers Over £145,000. Immediate internal viewing is of paramount importance to fully appreciate this excellent semi detached villa that offers ideal accommodation for todays growing family buyer. This property offers outstanding accommodation and benefits from being situated within the heart of a highly desirable area and being located within close proximity to a wide range of amenities. The property comprises entrance hallway, bay window lounge, bed 3/dining room, fitted kitchen, upper landing, two double sized bedrooms and converted bathroom offering shower room. The property benefits from gas central heating, double glazing and large monobloc driveway via twin wrought iron gates and fully enclosed landscaped gardens to both the front and the rear of the property. Internal viewing will surely impress!